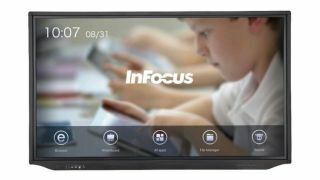 The What: InFocus Corporation has begun shipping an addition to its JTouch product family, the JTouch Plus INF8630AG. An Android-based interactive touch display solution built for collaboration, it featuring a 4K anti-glare 86-inch display that users can customize and annotate over any documents, whiteboard, browse the web, and run Android apps, plus wirelessly cast with ease using LightCast. The What Else: Like its predecessors in the JTouch line, the 86-inch JTouch Plus features the premium LightCast suite of presentation, teamwork, and content-sharing capabilities. Teachers and students can use a variety of pens and shapes to annotate on top of e-books, lessons and notes, web pages, or students’ work, and even spotlight areas of the screen to hide answers or focus attention. Teachers and presenters can also connect any device (HDMI, VGA, or PC), freeze the screen and annotate over any content, and then save screen captures to the internal storage or an external USB drive. It also features multi-device touch control, which allows presenters to plug in up to eight devices including smartphones, laptops, or tablets, without needing to change cables. In addition to LightCast, there is also wireless casting via built-in AirPlay that allows presenters and teachers to share work or lessons to the display from their mobile device or computer. For those looking to expand their JTouch Plus into a fully integrated, powerful all-in-one Windows 10 PC with touch, an optional Core i5 OPS PC module will be available soon. The Bottom Line: The 86-inch JTouch Plus is designed for education applications, using an open Android platform that allows users to install and use any applications from the Google Play Store. Students can interact with educational content, games, and information on the large screen as they would on a tablet.